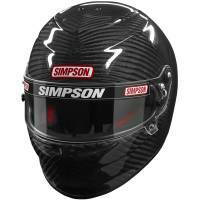 The Simpson Venator Pro auto racing helmet features an exceptionally strong outer shell and an energy absorbent liner. Plush interior with Simpson branded cheek pads. Super protection in a super lightweight helmet. Engineered to the prestigious FIA 8860 helmet standard, the VENATOR PRO - 8860 provides racers with increased protection in key impact areas. The lightweight outer shell restricts external penetration and works with the inner liner to increase energy absorption and reduce G-forces inside the helmet. The Venator Pro 8860 is FIA 8860 and Snell certified, and helmet peak accessories are available. Pit Stop USA offers Simpson Venator Pro Helmet 486000C, 486001C, 486002C, 486003C, 486004C, 486005C, 486006C at low everyday prices. Be sure to check out all our products from Simpson Performance Products including Simpson FIA Certified Auto Racing Helmets.